This blog was written by Arunesh Chandra, Senior Program Manager of Microsoft Edge, and Michael Dawson, IBM Community Lead for Node.js. You may have heard that Node.js has experimental support for N-API, a new API for native modules. Not anymore! N-API is now a stable and fully supported feature of Node.js as of version 10. It is also available as an experimental feature in Node.js 8 and 6. It not only adds to the maintenance burden for native module maintainers, but it also presents a major barrier to upgrading Node.js versions in production for module consumers, who have mission critical native code dependencies in their production deployments. With N-API, native module developers can compile their module once per platform and architecture, and make it available for any version of Node.js that implements N-API. This holds true even for versions of Node.js that are built with a different VM, e.g. Node-ChakraCore. N-API was put in as an experimental feature in Node.js 8.0, and after meeting rigorous exit criteria defined by the community, it has been promoted to a supported feature in Node.js 10. 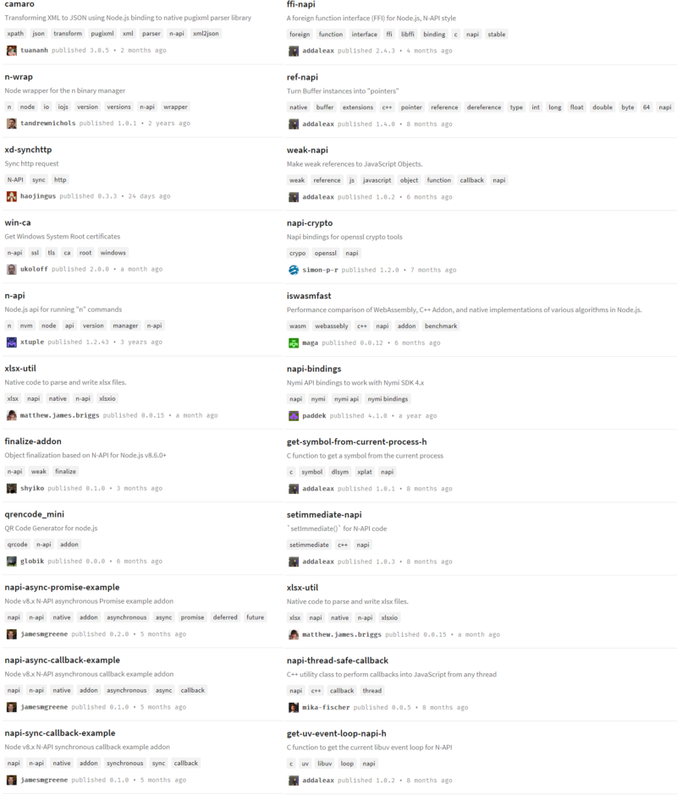 It has also been backported to all LTS release lines. Having N-API with the same API across all LTS releases is a great milestone and we believe this is a significant step towards enabling its adoption. Many thanks to Gabriel Schulhof who put in a tremendous amount of effort to backport this feature across these versions. 6.x — experimental, no warning. In backporting the updated APIs to 6.x, we believed a period of testing was necessary before making it stable. In addition, since 6.x is in maintenance mode, we’ll need to build consensus in the TSC in order to get the approval to make it stable in the future. Want to help? Please test with 6.x and provide feedback. Your feedback will help us determine if this feature is ready to be stable in 6.x. For native module authors, Node-pre-gyp is a great tool to publish binary packages that end-users can install. Since it’s such a crucial part of the existing Node.js native module ecosystem, the N-API team worked with the maintainer of node-pre-gyp to integrate support for building and publishing N-API modules. Many thanks to Jim Schlight and Dane Springmeyer who made this happen. Having Node-pre-gyp ready to support the N-API addons is another great milestone that we believe is a significant step towards enabling adoption. While N-API provides a C interface, many module developers use C++. The node-addon-api module provides an inlined wrapper that allows developers to use C++ and easily migrate from nan. The node-addon-api module was updated to use the N-API built-into 6.X such that it uses the built-in version of N-API for the latest versions of 6.x, 8.x and 10.x. There is a growing list of dependents on this module. The N-API team continues to focus on filling out the documentation for node-addon-api and addressing reported issues as we continue to see increased usage. We are pleased to see that developers embracing this feature and have started publishing N-API based native addons on npm. 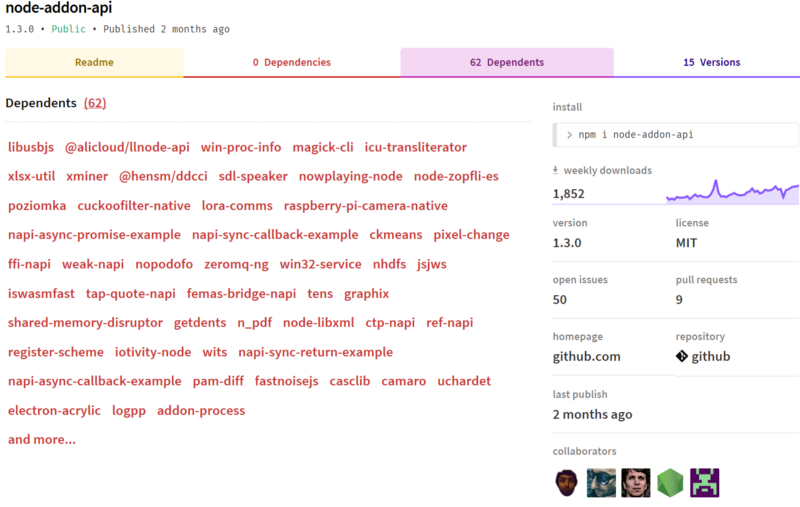 In addition to the N-API addon dependencies shown above, there are also a number of packages tagged as N-API. As adoption grows, we’d like to take the opportunity to regularly provide updates on some of the modules, which are adopting N-API. If you have a module that uses N-API in a unique or interesting way, or that you are just very proud of, let us know on the N-API repo so that we can highlight it for future updates. 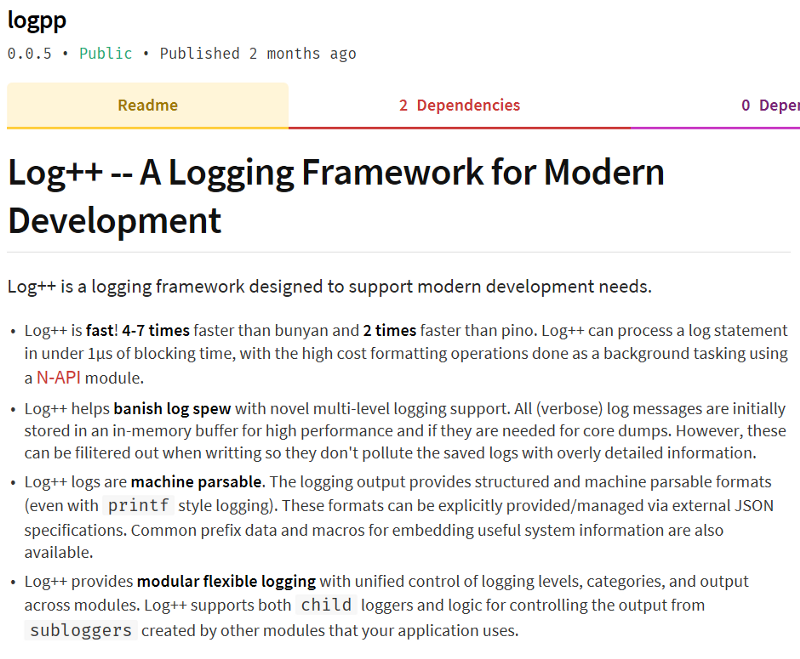 Today, we are highlighting Log++, which demonstrates N-API being used for logging into an application with high performance requirements. The result is a logger that is 4–7 times faster than existing logging solutions.